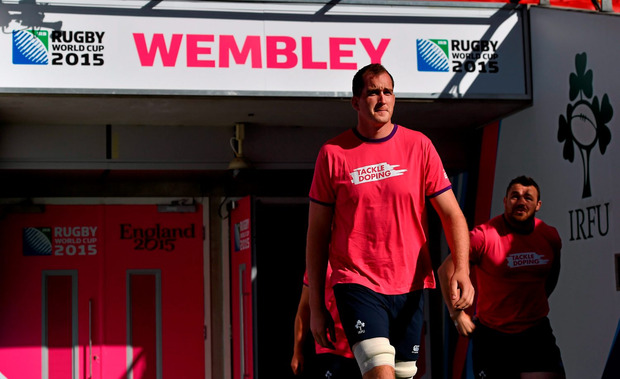 Can Devin Toner make a selection statement? Leinster lock Devin Toner played every match of Ireland's two straight Six Nations title campaigns, but was dropped without mercy at the start of the World Cup. Toner struggled in Ireland's 21-13 defeat to England in the final warm-up clash at Twickenham on September 5. The 6ft 11in lineout boss was then omitted from Ireland's side for the eventual 50-7 victory over Canada that opened the World Cup Pool D schedule. Ulster powerhouse Iain Henderson impressed against Canada in Cardiff and at present would partner Paul O'Connell in Ireland's first-choice starting line-up. Toner has spoken candidly about his need for a big performance against Romania, so will be itching to make his point at Wembley. Will Tommy Bowe get back to form? Bowe endured a nightmarish afternoon at Twickenham in Ireland's 21-13 defeat to England on September 5. The Ulster flyer slipped off a straightforward tackle to hand Jonny May the opening try, and had one of those afternoons when nothing went to plan. Just like Toner, Bowe was ousted for the World Cup opener against Canada. Now the 31-year-old wing has the chance to prove a point to boss Joe Schmidt, and to himself too, by hitting back to top form against Romania. Can Darren Cave command the midfield? Joe Schmidt included Darren Cave as a surprise addition in his final World Cup 31-man squad, drawing on the Ulster centre's specialist qualities at 12. Now Cave has his chance to prove his point against Romania, with regular starting inside centre Robbie Henshaw sidelined through hamstring trouble. Ireland expect Henshaw to be fit to face Italy in the third of four Pool D clashes, and are keen to see the Connacht battering ram back into action. Cave needs to produce a top-class performance against Romania to have any hope of altering Schmidt's long-range selection plans. Can Romania fly-half Miring Wiringi handle the occasion? Romania have long since boasted a gnarled and gritty pack, and today's Wembley clash will prove no exception. Behind the scrum has generally been a different equation altogether however, and fly-half Michael Wiringi will win just his second cap against Ireland. The 30-year-old has plied his trade in Romanian club rugby for the last four years, and only now has the chance to step up through the levels. Should the Six Nations impose promotion and relegation to help smaller nations? Romania coach Lynn Howells wants the Six Nations to usher in promotion and relegation to help the lower-ranked sides in Europe to flourish. Former Wales assistant coach Howells believes the World Cup is Romania's platform to launch that argument in style. Despite a gutsy showing against France in midweek Howells' men still slipped off the pace in the event to lose out 38-11. The chances of Romania springing an upset are slim to none, however well they fare for the first 60 minutes. Howells believes the best way for the lower nations to close the gap on the big guns will be through regular rugby against the top sides.